All modes use the same light source and switching them is simple. *Increasing the angle of incident light to slightly more than that of TIRF allows a deeper range of observation in the area near the coverglass. As this system uses a light source with a broad wavelength range, such as mercury illumination, by simply switching filters, TIRF observations are possible at a variety of wavelengths. 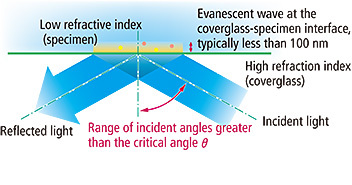 Nikon's high NA TIRF objectives make it possible to introduce laser illumination at incident angles greater than the critical angle (θc) resulting in TIRF that creates an evanescent wave immediately adjacent to the coverglass-specimen interface. The evanescent wave reaches maximally a few hundred nanometers into the specimen and its energy drops off exponentially. 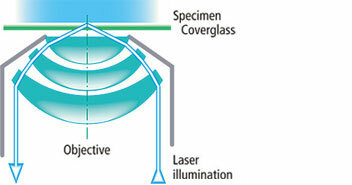 Nikon's laser TIRF system utilizes this evanescent wave to excite single molecules in the thin section in contact with the coverglass. 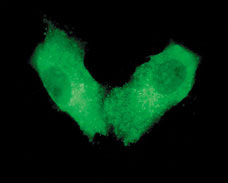 Because the specimen is not excited beyond the evanescent wave, this imaging system can produce fluorescence images with an extremely high signal-to-noise (S/N) ratio. These objectives are the world's first oil-immersion-type objectives to incorporate a correction ring for temperature changes and coverglass thickness. By rotating its correction collar, researchers can easily eliminate spherical aberrations' negative influence on the image quality resulting from temperature-induced changes in the refractive index of the immersion oil and influence from variation in the coverglass thickness. The lenses have been calibrated for a range from 23°C (room temperature) to 37°C (physiological temperature). 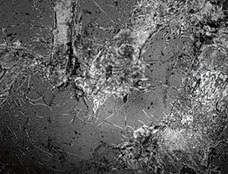 Additionally, these objectives also provide spectacular images under DIC, epi-fluorescence, confocal, and deconvolution imaging, while providing a strong trapping power during applications using laser tweezers. 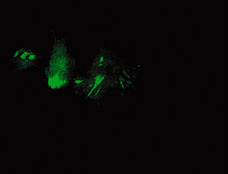 As evanescent wave illumination excites within approximately 100 nm from the glass surface, TIRF observations require that specimens contact the coverglass, otherwise no TIRF image is obtained. 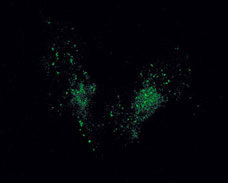 SRIC makes all sections in contact with glass appear black, allowing users to confirm whether a specimen has adhered to the glass before proceeding with TIRF observation. As no excitation light is used in this process, specimen damage is minimized and users can take their time focusing. 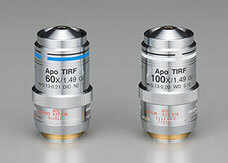 Nikon has developed an SRIC system that can be used with both the laser TIRF and white-light TIRF systems. Using SRIC is as simple as switching to the special filter cube.